Welcome to a genuinely outstanding disc in the Romantic Piano Concerto series. 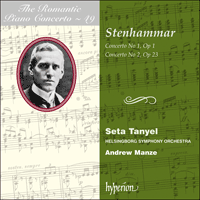 Sometimes the works found along the unfrequented byways of the Romantic piano tradition can exhibit no more than surface brilliance, but that cannot be said of these two splendid concertos by Stenhammar, recorded for the first time together on one CD. The original orchestration of Stenhammar’s Piano Concerto No 1 is recorded here: a version which was long thought lost when the publishers were bombed during the second world war – a copy of the original was discovered in the Library of Congress in 1983. The twenty-two year old’s Opus 1 is a masterpiece, majestic and virtuosic at its opening; bringing the listener into a world of Nordic mystery at the start of the third movement; the finale ending with music of sad, reflective sweetness. The second concerto is a distinctly different work, with an novel, some have said ‘improvised’, structure, and a sense of tension between soloist and orchestra which is only resolved in the glorious virtuosic finale. Hyperion is delighted to present the distinguished musician Andrew Manze in his new incarnation as a conductor. Directing the Helsingborg Symphony Orchestra, he is truly a force to be reckoned with. Pianist Seta Tanyel has featured on previous RPC recordings, always gaining the highest critical acclaim; however her magnificent playing on this new disc transcends her previous achievements. Within Sweden, Wilhelm Stenhammar has long been revered as something of a father figure to twentieth-century Swedish music. His Serenade for orchestra, second symphony and string quartets are deservedly admired pieces and many of his songs, both for solo voice and for choir, are cherished in a country famous for its singing, in particular Sverige (‘Sweden’, Op 22 No 2). Even among his less well-known works, such as the cantatas, piano pieces, violin sonata and incidental music to Chitra, there are many gems to be found. His activities as a composer were often curtailed by a combination of poor health, a periodic lack of confidence and a heavy concert schedule. During his lifetime he was perhaps best known as a performer, both on the piano, often in collaboration with another Swedish musical luminary, the violinist Tor Aulin (1866–1914) and his string quartet, and on the podium, notably as conductor of the Gothenburg Symphony Orchestra, of which he was artistic director from 1906 to 1922. His enterprising programmes included many Swedish premieres of repertoire we now accept as central but which at the time was a hard sell: music by the likes of Nielsen, Sibelius, Reger and Mahler. Stenhammar programmed his own music only occasionally, perhaps owing to his innate modesty and his tendency to self-criticism, two rather Swedish characteristics that have resulted in his works being far less familiar abroad than they deserve. As a young man Stenhammar never formally studied composition—that was to come much later, in 1909, with a vigorous, self-imposed regime of exercises in counterpoint—but his debut season in Stockholm shows how early he had acquired a wide range of interests and skills. On 2 February 1892, he played Saint-Saëns’ virtuosic piano quintet Op 14 with the Aulin string quartet, two weeks later saw the premiere of his first large-scale composition, I rosengården for soprano, tenor, choir and orchestra, and, sandwiched in between, was his concerto debut. The choice of concerto, Brahms’s first, Op 15 in D minor, was a significant one. Although Brahms was one of the most famous living composers, this was the concerto’s first public performance in Sweden, evidence of the young man’s adventurous musical appetite. In choosing this very concerto Stenhammar was making both the public statement that he was a Brahms man, rather than a camp follower of the Liszt school of virtuosity, and a private resolution to ally himself with the classical approach to composition, as opposed to the ‘modern’ way of Wagner and Bruckner. The third way out of the Brahms–Liszt/ classical–modern dilemma in those days, to explore one’s ethnic roots, was taken by some of his Swedish contemporaries, such as Hugo Alfvén and Wilhelm Peterson-Berger, but Stenhammar himself never embraced folk music wholeheartedly. Rather the opposite happened: his music helped to delineate a Nordic, idyllic style. Following his debut season Stenhammar spent a period in Berlin studying the piano before returning to Stockholm to write and perform his first piano concerto. The premiere was on 17 March 1893, in an all-Swedish programme (which included the first performance of Tor Aulin’s third violin concerto). Although it was far from being his first work (one might mention the exquisite ballad Florez och Blanzeflor, Op 3, 1891, as an early masterpiece), he had it published as his Op 1, thereby drawing attention to its clear Brahmsian credentials. The opening two orchestral chords could easily be (or are maybe intended to be?) mistaken for the opening of Brahms’s Tragic Overture Op 81 (1880). This opening gambit is then answered by the soloist, rather as Brahms did in his own second concerto, Op 83. Other Brahmsian touches range from the overall structure (Op 83 also has four movements) and key sequence (the movements are a major third apart: B flat minor–F sharp major–D major–B flat minor/major, an exact inversion of the innovative design of Brahms’ first symphony) to details such as the characteristic cross-rhythm of two against three between the pianist’s hands (track 1 from 1'20'', for example). But other influences are detectable also, not least that of Saint-Saëns in the second movement’s elfin lightness. It is hardly surprising that a twenty-two year old’s Op 1 is to a certain extent derivative but this concerto is far more than a collage of other men’s ideas. With the sublime horn melody at the start of the third movement we are transported to Nordic climes. And is there not something troll-like about the finale’s opening theme? Then, midway through the finale, the music changes its nature completely (at 6'40''). Stenhammar surprises us with a new mood and melody which, although the listener need not know it, is taken from one of his songs (Lutad mot gärdet, Op 8 No 1). The song’s text (by J L Runeberg, 1804–1877) is worth quoting, since it encapsulates the sad sweetness of Stenhammar’s early style and of fin-de-siècle Sweden. And there the boy stood alone! It is with this atmosphere rather than the concerto’s earlier virtuosity that Stenhammar chose to end his Op 1, a brave move for a fledgling composer. That there was an original voice to be heard here is reflected in the many welcoming reactions the concerto had, both in the press and amongst some of the musical stars of the day who immediately recognized the work’s pedigree and invited the composer to perform it, notably Richard Strauss, Arthur Nikisch, Karl Muck and Hans Richter. Stenhammar himself only stopped performing the piece in 1909 when he had a second concerto to offer, but other pianists continued to play it for two more decades. After that, fate had other plans for the piece. The years between the first and second concertos saw the launch of Stenhammar’s conducting career with the premiere of his concert overture Excelsior! Op 13 in 1896. But there were also some failures along the way which precipitated something of a crisis of confidence for Stenhammar the composer. Two unsuccessful operas in the 1890s were followed by a symphony in F major, completed, performed and immediately withdrawn, probably as a reaction to the revelatory experience of encountering Sibelius’s second symphony Op 43 for the first time. It could be said that in working for at least three years to complete the second piano concerto Stenhammar entered his ‘middle’ period. Any outward similarities between the two concertos (four movements, with the scherzo placed second and the middle two in keys far distant from home) are outnumbered by their different events and the later work’s novel, some have said ‘improvised’, structure. Unlike the first concerto, the second starts in an unsettling way: the piano’s tentative opening phrase in D minor is immediately contradicted by the orchestra’s cellos and basses which pull the key downwards. This tonal tug of war between orchestra and piano becomes the main ‘story’ and is all the more confusing because the soloist is the one defending the ‘correct’ key, a lone voice against the orchestra’s powerful attempts to destabilize it (at 1'34'' in track 5, for example). In a long, unaccompanied paragraph the piano presents a second theme and establishes some tonal security (from 2'04''—this passage is a good example of the huge chords Stenhammar requires of both the pianist’s hands) but the tension between soloist and orchestra about the very key of the piece (traditionally something agreed upon before starting!) runs through the whole of the first two movements. (Listen to the argument during the last half minute of track 5.) The cantabile third movement is in C sharp minor, the key to which the orchestra has been gravitating, and it is only by means of a beautiful and subtle transition that the soloist finally convinces the orchestra to come ‘home’ to D major for a glorious, virtuosic finale. After some detective work Allan Ho produced two possible odysseys for the score, knowing that it had passed through the hands of a Berlin antiquarian music dealer, Leo Liepmannssohn, in 1904. Stenhammar studied in Berlin during 1892–3 and no doubt hatched the idea for the concerto there. He was in Berlin again in 1894 to perform it, so it is possible that there was a copy of the score which passed to the Library of Congress via Liepmannssohn. Alternatively, Hainauer may have produced a copy so that the concerto could receive its US premiere (in New York on 1 March 1898) without risking the original score on a trans-Atlantic journey or losing the possibility of further performances while it was out of European circulation. The soloist at that US premiere was the German pianist Franz Rummel who, soon after, moved to Berlin. Did the score travel back with him? He died in 1901 and his American widow moved back to settle in Washington D.C. Thence to the Library of Congress? QED? We may never know but we should rejoice that, thanks to Professor Ho, we have Stenhammar’s Op 1 back intact. It is that original version which is presented here, in the hope that both Stenhammar’s fine concertos will continue their worldwide travels by means of this recording—without further mishap. En Suède, Wilhelm Stenhammar est vénéré depuis longtemps, un peu comme l’image du père de la musique suédoise du XXe siècle. Sa Sérénade pour orchestre, sa Symphonie no 2 et ses quatuors à cordes sont des œuvres admirées à juste titre et un grand nombre de ses chants et mélodies, pour voix soliste comme pour chœur, sont particulièrement appréciés dans un pays réputé pour le chant, en particulier Sverige («Suède», op. 22 no 2). Même parmi ses œuvres moins célèbres, comme les cantates, les pièces pour piano, la Sonate pour violon et piano et la musique de scène de Chitra, on peut trouver de nombreux joyaux. Ses activités de compositeur ont été souvent victimes d’une santé précaire, d’un manque cyclique de confiance en soi et d’un lourd programme de concerts. De son vivant, il était peut-être mieux connu comme interprète, que ce soit au piano, souvent avec une autre sommité musicale suédoise, le violoniste Tor Aulin (1866–1914) et le quatuor à cordes fondé par celui-ci, ou sur l’estrade de chef d’orchestre, notamment à la tête de l’Orchestre symphonique de Göteborg, dont il a été directeur artistique de 1906 à 1922. Ses programmes audacieux comprenaient de nombreuses créations suédoises d’œuvres du répertoire que l’on considère aujourd’hui comme essentielles, mais qui étaient difficiles à vendre à l’époque: de la musique de compositeurs comme Nielsen, Sibelius, Reger et Mahler. Stenhammar n’a programmé sa propre musique qu’occasionnellement, peut-être en raison de sa modestie naturelle et de sa tendance à l’autocritique, deux caractéristiques assez suédoises à cause desquelles ses œuvres sont beaucoup moins connues qu’elles le méritent à l’étranger. Dans sa jeunesse, Stenhammar n’a jamais étudié de manière spécifique la composition—il allait le faire beaucoup plus tard, en 1909, en s’imposant un régime vigoureux d’exercices de contrepoint—mais la saison de ses débuts à Stockholm révèle le développement rapide de ses centres d’intérêt et de ses compétences. Le 2 février 1892, il a joué le virtuose Quintette avec piano, op. 14, de Saint-Saëns avec le Quatuor à cordes Aulin, deux semaines plus tard a eu lieu la création de sa première composition d’envergure, I rosengården pour soprano, ténor, chœur et orchestre, et, entre les deux, il a fait ses débuts en concerto. Le choix du concerto, le Concerto pour piano no 1 en ré mineur, op. 15, de Brahms, a été important. Même si Brahms était l’un des compositeurs vivants les plus célèbres, c’était la première exécution publique de ce concerto en Suède, signe manifeste de l’appétit musical aventureux du jeune homme. En choisissant ce concerto-là, Stenhammar s’affirmait publiquement comme un brahmsien, plutôt qu’un sympathisant de l’école de virtuosité de Liszt, et montrait qu’il était résolu à rejoindre l’approche classique de la composition, par opposition à la manière «moderne» de Wagner et de Bruckner. À cette époque, la troisième voie pour sortir du dilemme Brahms–Liszt/classique–moderne était l’exploration des racines ethniques, comme l’ont fait certains de ses contemporains suédois, tels Hugo Alfvén et Wilhelm Peterson-Berger, mais Stenhammar ne s’est jamais totalement engagé dans la musique traditionnelle. C’est plutôt le contraire qui s’est produit: sa musique a aidé à déterminer un style idyllique nordique. Après la saison de ses débuts, Stenhammar est allé étudier le piano quelque temps à Berlin avant de revenir à Stockholm pour écrire et jouer son premier concerto pour piano. La création a eu lieu le 17 mars 1893, au sein d’un programme entièrement suédois (qui comprenait la première exécution du Concerto pour violon no 3 de Tor Aulin). Même si c’était loin d’être sa première œuvre (on peut mentionner la charmante ballade Florez och Blanzeflor, op. 3, 1891, comme chef-d’œuvre de jeunesse), il l’a fait publier comme son op. 1, attirant ainsi l’attention sur ses références brahmsiennes évidentes. Les deux premiers accords de l’orchestre pourraient aisément être pris pour le début de l’Ouverture tragique, op. 81 (1880) de Brahms (ou peut-être est-ce voulu). Cette façon d’entrer en matière reçoit ensuite une réponse du soliste, un peu comme l’a fait Brahms dans son propre Concerto no 2, op. 83. Les autres touches brahmsiennes vont de la structure générale (l’op. 83 comporte aussi quatre mouvements) et de la séquence de tonalités (les mouvements sont à une tierce majeure d’écart: si bémol mineur–fa dièse majeur–ré majeur–si bémol mineur/majeur, renversement exact du modèle novateur de la première symphonie de Brahms) jusque dans des détails comme les superpositions rythmiques caractéristiques de deux contre trois entre les mains du pianiste (comme la plage 1 à 1'20", par exemple). Mais on discerne aussi d’autres influences, la moindre n’étant pas celle de Saint-Saëns dans la légèreté délicate du deuxième mouvement. Il n’est guère surprenant que l’op. 1 d’un jeune homme de vingt-deux ans soit, dans une certaine mesure, inspiré d’autres sources, mais ce concerto est bien plus qu’un collage d’idées d’autres compositeurs. Avec la sublime mélodie de cor au début du troisième mouvement, nous sommes transportés sous des cieux nordiques. Et n’y a-t-il pas quelque chose qui fait penser à un troll dans le thème initial du finale? Ensuite, au milieu de ce finale, la nature de la musique change complètement (à 6'40"). Stenhammar nous surprend avec une nouvelle atmosphère et un nouveau thème qui, ce que l’auditeur ne sait pas forcément, est emprunté à l’une de ses mélodies (Lutad mot gärdet, op. 8 no 1). Le texte de la mélodie (de J. L. Runeberg, 1804–1877) mérite d’être cité car il résume la triste douceur du style de Stenhammar dans sa jeunesse et de la Suède fin-de-siècle. Le garçon se tenait seul! Elle gisait évanouie au creux de la terre. Riche de toutes ses fleurs. C’est davantage dans cette atmosphère qu’avec la virtuosité précédemment exposée du concerto que Stenhammar a choisi de terminer son op. 1, ce qui était courageux pour un compositeur frais émoulu. Le fait qu’il y avait là une voix originale à entendre se reflète dans les nombreuses réactions positives qu’a suscitées ce concerto, à la fois dans la presse et de la part de certaines personnalités éminentes du monde de la musique de l’époque qui ont immédiatement reconnu les antécédents de l’œuvre et ont invité le compositeur à la jouer, notamment Richard Strauss, Arthur Nikisch, Karl Muck et Hans Richter. Stenhammar lui-même n’a cessé de jouer cette pièce qu’en 1909, lorsqu’il a eu à proposer un second concerto, mais d’autres pianistes ont continué à l’interpréter pendant une vingtaine d’années encore. Après, le sort en a décidé autrement pour cette œuvre. Les années qui se sont écoulées entre le premier et le second concerto ont vu le démarrage de la carrière de chef d’orchestre de Stenhammar avec la création de son ouverture de concert Excelsior!, op. 13 en 1896. Mais il a aussi rencontré quelques échecs en chemin, ce qui a précipité une sorte de crise de confiance pour Stenhammar dans le domaine de la composition. Deux opéras sans succès au cours des années 1890 ont été suivis d’une symphonie en fa majeur, achevée, exécutée et immédiatement retirée, probablement après l’expérience révélatrice de la première rencontre avec la Symphonie no 2, op. 43, de Sibelius. On pourrait dire qu’en travaillant pendant au moins trois ans à l’achèvement de son second concerto pour piano, Stenhammar est entré dans sa période «médiane». Toutes les similitudes apparentes entre les deux concertos (quatre mouvements, le scherzo placé en deuxième et les deux mouvements médians dans des tonalités distantes de la tonalité d’origine) sont surpassées en nombre par leurs différentes manifestations et par la structure nouvelle, certains ont dit «improvisée», du deuxième. Contrairement au premier concerto, le second commence d’une manière troublante: la première phrase ténue en ré mineur du piano est immédiatement contredite par les violoncelles et les contrebasses de l’orchestre qui abaissent la tonalité. Cette petite guerre tonale entre l’orchestre et le piano devient la principale «histoire» et est d’autant plus déroutante que le soliste est le défenseur de la tonalité «correcte», une voix solitaire contre les tentatives puissantes de l’orchestre pour la déstabiliser (à 1'34" de la plage 5, par exemple). Dans un long passage sans accompagnement, le piano présente un second thème et établit une certaine sécurité tonale (à partir de 2'04"—un bon exemple des accords gigantesques que Stenhammar exige des deux mains du pianiste), mais la tension entre le soliste et l’orchestre à propos de la véritable tonalité de la pièce (traditionnellement on se met d’accord avant de commencer!) subsiste dans l’intégralité des deux premiers mouvements. (Écoutez l’argument pendant les trente dernières secondes de la plage 5.) Le troisième mouvement cantabile est en ut dièse mineur, la tonalité autour de laquelle l’orchestre a gravité, et c’est seulement en ayant recours à une magnifique et subtile transition que le soliste convainc finalement l’orchestre de revenir à la tonalité d’origine de ré majeur pour un magnifique finale tout en virtuosité. Après avoir fait un travail de détective, Allan Ho a produit deux odyssées possibles pour cette partition, sachant qu’elle était passée entre les mains d’un marchand de musique antiquaire à Berlin, Leo Liepmannssohn, en 1904. Stenhammar avait étudié à Berlin en 1892–1893 et l’idée du concerto avait certainement commencé à germer à cette époque. Il est retourné à Berlin en 1894 pour le jouer et il est donc possible qu’une copie de la partition soit passée à la Library of Congress par l’intermédiaire de Liepmannssohn. Sinon, Hainauer a pu faire une copie pour la première exécution américaine du concerto (à New York, le 1er mars 1898) pour éviter de prendre le moindre risque en envoyant outre-Atlantique la partition originale ou de perdre la possibilité d’autres exécutions pendant qu’elle aurait été hors du circuit européen. Lors de la création américaine, le soliste était le pianiste allemand Franz Rummel qui, peu après, s’est installé à Berlin. La partition est-elle revenue avec lui? Il est mort en 1901 et sa veuve américaine est retournée vivre à Washington. De là à la Library of Congress? CQFD? On ne le saura peut-être jamais, mais nous pouvons nous réjouir d’avoir récupéré intact l’op. 1 de Stenhammar, grâce au Professeur Ho. C’est la version originale qui est présentée ici, dans l’espoir que les deux beaux concertos de Stenhammar poursuivront leurs voyages à travers le monde grâce à ce disque—sans autre incident. In Schweden wird Wilhelm Stenhammar schon seit langem als eine Art Vaterfigur der schwedischen Musik des 20. Jahrhunderts verehrt. Seine Serenade für Orchester, die zweite Symphonie sowie die Streichquartette werden zu Recht bewundert und viele seiner Lieder (sowohl für Solostimme als auch für Chor) werden in dem Land, das für seinen Gesang berühmt ist, in Ehren gehalten—insbesondere Sverige („Schweden“, op. 22 Nr. 2). Selbst unter seinen weniger berühmten Werken, wie etwa den Kantaten, Klavierstücken, der Violinsonate und der Bühnenmusik zu Chitra, können noch eine ganze Reihe von Juwelen aufgedeckt werden. Stenhammars kompositorisches Schaffen wurde oft durch Krankheit, Phasen der Entmutigung sowie durch seinen vollen Konzertplan eingeschränkt. Zu seinen Lebzeiten war er wahrscheinlich als Ausführender bekannter—sowohl als Pianist, oft zusammen mit einem weiteren schwedischen Meister, dem Geiger Tor Aulin (1866–1914) und dessen Streichquartett, und auch als Dirigent, insbesondere der Göteborger Symphoniker, deren Chefdirigent er von 1906 bis 1922 war. In seine kühne Programmgestaltung nahm er viele schwedische Premieren von Werken auf, die heutzutage zum Stamm-Repertoire zählen, sich damals jedoch nicht ohne weiteres präsentieren ließen—dazu zählten Werke von Nielsen, Sibelius, Reger und Mahler. Stenhammar stellte seine eigenen Werke nur selten aufs Programm, vielleicht aufgrund seiner Bescheidenheit und seiner Tendenz zur Selbstkritik, zwei typisch schwedische Eigenheiten, die dazu geführt haben, dass seine Werke außerhalb Schwedens weitaus weniger bekannt sind, als sie es verdienen. Als junger Mann studierte Stenhammar nie formal Komposition—das sollte erst viel später, 1909, mit einem umfangreichen, selbstauferlegten Kontrapunkt-Trainingsprogramm geschehen—doch demonstrierte seine Debütsaison in Stockholm, wie früh er bereits vielseitig interessiert war und sich ein ganzes Spektrum von Fertigkeiten angeeignet hatte. Am 2. Februar 1892 führte er das virtuose Klavierquintett op. 14 von Saint-Saëns zusammen mit dem Aulin-Streichquartett auf, zwei Wochen später fand die Premiere seiner ersten groß besetzten Komposition statt—I rosengården für Sopran, Tenor, Chor und Orchester—und dazwischen gab er sein Solokonzert-Debüt. Dafür wählte er Brahms’ erstes Klavierkonzert op. 15 in d-Moll, was bedeutsam war: obwohl Brahms einer der berühmtesten lebenden Komponisten war, wurde das Konzert zu diesem Anlass in Schweden erstmals öffentlich aufgeführt, was wiederum den kühnen musikalischen Appetit des jungen Mannes beweist. Mit der Wahl dieses Konzerts bekundete Stenhammar einerseits öffentlich, dass er ein Brahms-Anhänger war und nicht der Virtuosenschule Liszts angehörte und andererseits fasste er für sich den Vorsatz, sich der klassischen Kompositionsweise anzuschließen und nicht der „modernen“ von Wagner und Bruckner. Der dritte Ausweg aus dem Dilemma Brahms–Liszt, bzw. klassisch–modern, den einige seiner schwedischen Zeitgenossen (wie etwa Hugo Alfvén und Wilhelm Peterson-Berger) einschlugen, war die Auseinandersetzung mit der eigenen ethnischen Herkunft, doch konnte sich Stenhammar für Volksmusik nie wirklich erwärmen. Stattdessen trat das Gegenteil ein: seine Musik trug zu der Herausbildung eines nordischen, idyllischen Stils bei. Nach seiner Debütsaison hielt sich Stenhammar für eine Weile in Berlin auf, wo er Klavier studierte, bevor er wieder nach Stockholm zurückkehrte, um dort sein erstes Klavierkonzert zu komponieren und aufzuführen. Die Premiere fand am 17. März 1893 statt und war Teil eines rein schwedischen Konzertprogramms (in dem auch das dritte Violinkonzert von Tor Aulin uraufgeführt wurde). Obwohl es keineswegs sein erstes Werk war (hier könnte man etwa die exquisite Ballade Florez och Blanzeflor op. 3 von 1891 als eines seiner frühen Meisterwerke nennen), hatte er es als sein Opus 1 herausgegeben und damit deutlich auf den Einfluss von Brahms hingewiesen. Die ersten beiden Orchesterakkorde könnten ohne weiteres (sollen vielleicht sogar?) mit dem Anfang von Brahms’ Tragischer Ouvertüre op. 81 (1880) verwechselt werden. Diese Anfangsfigur wird dann von dem Solisten beantwortet, ähnlich wie es in Brahms’ zweitem Konzert op. 83 passiert. Weitere Brahms’sche Anklänge sind von der Anlage des Werks (op. 83 hat ebenfalls vier Sätze) über die Tonartenabfolge (zwischen den Sätzen liegt jeweils eine große Terz: b-Moll/Fis-Dur/D-Dur/b-Moll bzw. B-Dur; es ist dies eine exakte Umkehrung der innovativen Anlage von Brahms’ erster Symphonie) und bis hin zu Details wie dem charakteristischen Polyrhythmus, wobei die eine Hand des Pianisten einen Zweierrhythmus und die andere einen Dreierrhythmus zu spielen hat (etwa in Track 1 bei 1'20''), festzustellen. Es werden jedoch auch andere Einflüsse deutlich, nicht zuletzt der von Saint-Saëns, der sich besonders durch die elfenhafte Leichtigkeit des zweiten Satzes bemerkbar macht. Es ist kaum überraschend, dass das Opus 1 eines 22-Jährigen bis zu einem gewissen Grad an seine Vorbilder angelehnt ist, doch ist dieses Konzert weitaus mehr als eine bloße Collage der Ideen anderer Komponisten. Die großartige Hornmelodie zu Beginn des dritten Satzes transportiert die Zuhörer in nordische Gegenden. Und ist in dem Anfangsthema des Finales nicht etwas Trollartiges herauszuhören? Später, etwa in der Mitte des Finalsatzes wandelt sich die Musik völlig (bei 6'40''). Stenhammar überrascht sein Publikum mit einer neuen Stimmung und einer Melodie, die, obwohl der Zuhörer das nicht unbedingt wissen muss, aus einem seiner Lieder (Lutad mot gärdet, op. 8 Nr. 1) stammt. Es ist lohnenswert, den Text dieses Liedes (von J.L. Runeberg, 1804–1877) anzuführen, da er die traurige Süße des frühen Stils Stenhammars und des Schwedens des Fin-de-siècle veranschaulicht. und da stand der Junge allein! Stenhammar entschloss sich dazu, sein Opus 1 mit dieser Atmosphäre, und nicht mit der Virtuosität, die früher im Werk dargestellt wird, zu beenden—ein kühner Schritt für einen jungen Komponisten. Dass sich hier eine originelle Stimme zu Wort meldete, wird von den vielen positiven Reaktionen auf das Konzert bestätigt, sowohl von Seiten der Presse als auch von einer Reihe von angesehenen Musikern der Zeit, insbesondere Richard Strauss, Arthur Nikisch, Karl Muck und Hans Richter, die das Format des Werks sofort erkannten und den Komponisten dazu einluden, es aufzuführen. Stenhammar bot das Werk bis 1909 öffentlich dar, als er ein zweites Konzert anzubieten hatte, doch andere Pianisten sollten es noch über zwanzig Jahre lang aufführen. Danach hatte das Schicksal andere Pläne für das Stück. In der Zeit zwischen dem ersten und dem zweiten Klavierkonzert fand der Auftakt zu Stenhammars Karriere als Dirigent mit der Premiere seiner Konzertouvertüre Excelsior! op. 13 im Jahr 1896 statt. Doch erlebte er währenddessen auch einige Misserfolge, die eine gewisse Krise seines Selbstverständnisses als Komponist hervorrief. Auf zwei erfolglose Opern in der 1890er Jahren folgte eine Symphonie in F-Dur, die fertiggestellt, aufgeführt und dann sofort zurückgezogen wurde, wahrscheinlich als Reaktion auf eine Schlüsselerfahrung—die erstmalige Begegnung mit der zweiten Symphonie von Sibelius, op. 43. Man könnte sagen, dass Stenhammar während der Arbeit an seinem zweiten Klavierkonzert—ein Prozess, der mindestens drei Jahre lang andauerte—in seine „mittlere“ Schaffensperiode eintrat. Zwar sind einige äußere Parallelen zwischen den beiden Werken gegeben (eine viersätzige Anlage, wobei das Scherzo an zweiter Stelle kommt und die beiden mittleren Sätze in entfernten Tonarten stehen), doch sind die Unterschiede weitaus zahlreicher, nicht zuletzt aufgrund der neuartigen (manche haben sogar gesagt „improvisierten“) Struktur des Werks. Anders als das erste Konzert fängt das zweite in verunsichernder Weise an: die zögernde Anfangsphrase des Klaviers in d-Moll wird sofort von den Celli und Kontrabässen im Orchester angefochten, die die Tonart hinunterziehen. Dieses tonale Tauziehen zwischen Orchester und Klavier rückt in den Mittelpunkt, was umso verwirrender ist, weil der Solist als einzige Stimme gegen die mächtigen Destabilisierungsversuche des Orchesters (zum Beispiel bei 1'34'' in Track 5) die „richtige“ Tonart vertritt. In einer langen, unbegleiteten Passage stellt das Klavier ein zweites Thema vor und stabilisiert die Tonalität etwas (ab 2'04''—in dieser Passage wird die große Spanne der Akkorde besonders deutlich, die Stenhammar für beide Hände des Pianisten setzt), doch die Spannung zwischen Solist und Orchester bezüglich der Grundtonart des Stücks (die normalerweise vor dem Beginn festgelegt wird!) zieht sich durch den gesamten ersten und zweiten Satz. (Man höre sich die Auseinandersetzung in der letzten halben Minute von Track 5 an.) Der kantable dritte Satz steht in cis-Moll, die Tonart, auf die sich das Orchester hinbewegt hat. Erst durch eine wunderschöne und subtile Überleitung gelingt es dem Solisten schließlich, das Orchester zur „Grundtonart“ zu führen und es erklingt ein großartiges, virtuoses Finale. Nach einiger Detektivarbeit entwickelte Allan Ho zwei mögliche Theorien, die die Odyssee der Partitur erklären könnten. Er wusste, dass sie 1904 eine Zeitlang im Besitz des Berliner Musikantiquariats Leo Liepmannssohns gewesen war. Stenhammar studierte 1892–93 in Berlin und entwickelte dort sicherlich die ersten Ideen für das Konzert. 1894 reiste er nochmal nach Berlin, um es dort aufzuführen; daher ist es also möglich, dass eine Kopie der Partitur über Liepmannssohn an die Library of Congress gelangte. Die andere Möglichkeit wäre, dass Hainauer eine Kopie für die Erstaufführung in den USA (in New York am 1. März 1898) anfertigte, um der Originalpartitur nicht das Risiko einer transatlantischen Reise zuzumuten und um nicht weitere Aufführungen in Europa zu verhindern, weil sich die Noten in Amerika befanden. Der Solist der Premiere in den USA war der deutsche Pianist Franz Rummel, der kurz darauf nach Berlin zog. Nahm er die Partitur mit? Er starb 1901 und seine amerikanische Witwe zog in die Vereinigten Staaten zurück und ließ sich in Washington D.C. nieder. Von dort aus zur Library of Congress? Quod erat demonstrandum? Möglicherweise werden wir es niemals sicher wissen, doch ist es sehr erfreulich, dass dank Professor Ho Stenhammars Opus 1 wieder intakt ist. Es liegt hier in der Originalversion vor, in der Hoffnung, dass die beiden hervorragenden Konzerte Stenhammars mithilfe dieser Aufnahme—und ohne weitere Malheurs—ihre Reisen durch die ganze Welt fortsetzen werden.